Ankh: Represents the breath of life, and is an image of the energy system of our being. It is a gateway to the stars. 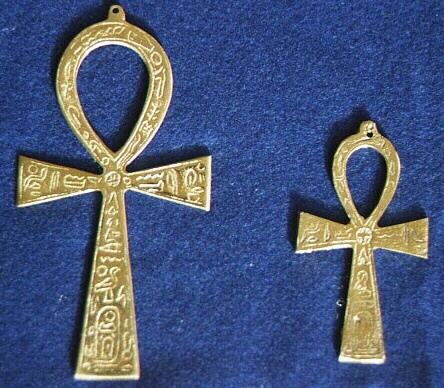 The Ankh is available in two sizes 4" & 7" tall. Made in Egypt. Prices: $8.00 for the 4"; $12.00 for the 7"
*Djed: Represents stability, the Tree of Life, and awakening of the human soul. This was created by a local artist using the lost wax technique. This bronze Djed is a three dimensional creation. It can be worn as an amulet or can stand on your altar. Wear this amulet for grounding, balancing and aligning your energies. The Djed is approximately 1½" tall. *Sekhmet: Is an Ancient Egyptian Neter who represents fire, destruction, rebirth and transformation. This bronze amulet was created using the lost wax technique. Sekhmet can be worn around your neck or will stand on the altar. Wear Sekhmet to activate the Sekhem/kundalini energies. Sekhmet is approximately 2¼" tall. *Uas: Is a symbol of power and is used to call the Neters. Through the power of sound and vibration the Uas is able to activate and align the energies within ourselves. 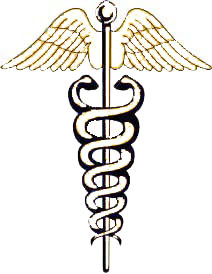 Often seen in Ancient Egyptian art with the Ankh and the Djed representing life, stability and power. This bronze amulet was created using the lost wax technique. The Uas can be worn around your neck or can be place on your alter in a Scarab stand. The Scarab was a sacred symbol to the Ancient Egyptians representing rebirth. The Uas is approximately 3¼" tall. The Uas is also available in silver. Price: $33.00/ $55.00 with the Scarab stand. The Silver Uas $40.00. To place an order please call 503-228-5682 or e-mail with your credit card to djedu@egyptianhealing.com We accept payment by visa, mastercard or check. You may send a check to Elements of Health Inc, PO Box 83126, Portland, OR 97283. Please add the Shipping from the table below.